Front of postcard from Vera Wheeler to Tom Myers. "...it was written by my grandmother, Vera Wheeler, to her grandfather, Thomas J. Myers. The card was postmarked July 10, 1908, at Godley. Interestingly, the postcard itself was copyrighted in 1908. I'll type the message for ease of comparison. It says, "Dear Grandpa. I got your card yesterday and was more than glad to get it. Tell Verna hello and I will send her one before long. I am over to see Tessie and we are having lots fun and we had all the ice-cream we wanted. Good Bye, Vera Wheeler." It is addressed to Mr. T J Myers, McGirk, Texas. Tessie was aunt Lillie's daughter who died of undetermined causes (I've always heard of poisoning resulting from scraping the insides of the can used for freezing ice-cream) not long after she had graduated from high school. Verna, of course, was my grandmother's older sister. 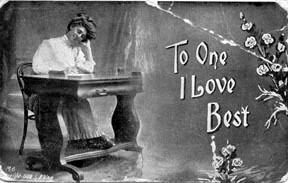 This card is only of interest to you as a rare speciman of an early writing to and from people related to us." From Tom: "The photo I'm sending has the following notation on the reverse. 'Cleburne. Aunt lived here when Grandmother Myers was killed when horse ran away with buggy. I belive the aunt refered to is Myrtle Myers Vinther. My grandmother lived with the Vinthers some. She always thought Aunt Myrtle was too hard on her. The handwriting may be my grandmother's, Vera Wheeler Horton's, or it could possibly be that of my mother. I'm unsure. I believe the farm was located in Godley. I do not believe the buildings are in existence today. The photo is faded. From Tom: "This is identified as Aunt Myrtle's house. That means that it is the same house pictured in the earlier photo I sent of the Vinther farm. This photo was taken in January of 1959. 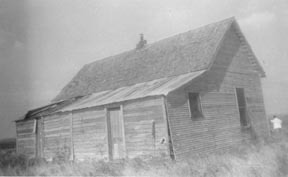 The inscription says: "Mother (Vera Wheeler) lived here at Aunt Myrtle's in Godley. House burned." My mother Wille Retta Horton Andrews-Locklear wrote the inscription.